A Life On--and After--the Farm: My 100th Goat, er,.. I mean post! Actually, this is my 231st post, if you count all 3 blogs... but who's counting? I've been meaning to post some pics of the goats for a while now. This morning I saw a cute goat photo on another blog, and it prompted me to grab the camera before the rain came. As usual, the goats were not very cooperative for the camera. They are sweet and loving, but they never stand still for photos! 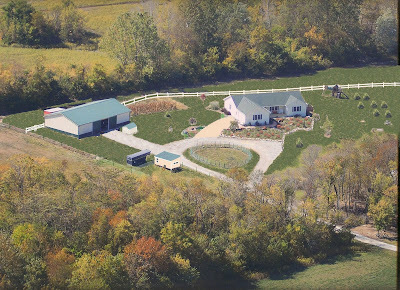 Below is an aerial photo of our farm, taken for county records in 2003. 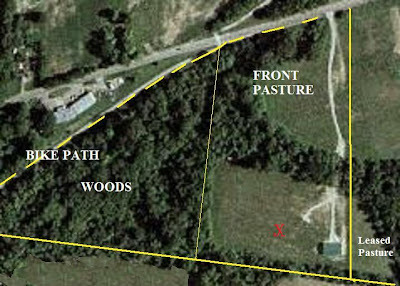 I labeled it so you would have a reference now when you read about the front pasture, etc. The property lines are marked in yellow. We own 2 tracts; one mostly open field, the other woods. The small area in the lower right labeled 'leased' is what I call the side pasture. We lease it for $1 a year. It's a little hard to see, but the red 'X' marks where our house now stands. 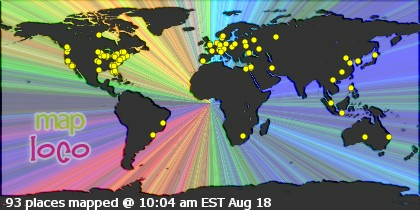 The V drive now circles around, and in the center of it is the round pen. We built the barn first, then the house. We moved in on Hubby's birthday in December of 2003. This is the way our farm will look some day... The photo was taken last fall. I embellished it just a tad. The pine trees on the right are much smaller and the front garden isn't finished yet. I erased all the parked stuff and greened up the front lawn. I had to finish 'building' the hen house, as Hubby didn't even have it under roof for this pic. Do you like the added touch of the white 'horse' fence? OK, maybe I'm dreaming there. It will probably remain the white electric rope that stands there now. So there. My 100th post featured the entire farm. I thought that was appropriate. Now on to my intended post. Introducing my other herd... the goats. Elvis has left the building, but he's now in my pasture. He had that name when we acquired him. He is much older than the others. Notice the nice beard. Mr. Universe... We call him Oreo. When he was a baby he had a big 'O' on his belly. Now it's grown into a 'C'. He has curly hair, and in the summer when it gets its reddish tint, he it absolutely gorgeous! He is also the leader of the herd, and the most brave. Last, but certainly not least, is Derby. I call him my lover boy. He doesn't know when to stop eating, so he's a little chubby. He loves kisses and affection. Definitely my favorite! I named him Derby because of his white markings. When he was a baby, it looked like he was wearing an English saddle. Now that he's full grown, you'll just have to use your imagination. We had two other goats that passed away last year. Biscuit was the runt of the litter, and silly Willie was the comic. It broke my heart when Willie died. He had the most comical personality. I miss how he made me laugh. Our goats are Nubians, a large dairy breed. We don't breed Nanny, so we don't have milk. They work on keeping the woods cleared out, and have well earned their keep! They follow us whenever we take walks through the woods, and come running when I call them. They are not the smartest creatures God put on this earth, but they are certainly among the sweetest! What a great farm. I like all the extra touches you added. The goats are cute and isn't it nice that they cooperated and posed for the camera. Nanny is a lucky girl to be surrounded by all that male attention. Congats on #100 and 231 also. I sure enjoyed your description of the goats. And you're right, oh my, Derby DOES like to eat, doesn't he? They are really adorable goats, and I, who have little to no contact with them, wonder: do they really smell?? I love your farm, it's lovely. The goats are even cute! Elvis and Oreo though, that is original!! Congrats on the 100th post, I'm being good and doing what I'm supposed to be doing, cleaning and sorting, found something I thought was long gone!! whoo hoo!! Hey, you got a big farm Lilly, and I wish I could have something that big someday where I could put all what I wanted to have in my farm. Some fruit bearing trees there, some herbal plants here. Two cows is okay, goats, chicken oh I have lots of pictures in my mind. Thanks for sharing it. And thanks for posting a pic of Oreo and yes it's true the "O" has become a "C", do you call him "Coreo" now? A big congrats on the 100th post! I love your farm it is beautiful and it is nice to have a photo of how you want everything to look when it's finished. It will be great. The goats are just the cutest things ever, Nanny just looks sweet. Oreo is so handsome. Congratulations on 100!! I love the photos of your farm. I know you will not believe me now, but I was going to ask you to post pictures of your goats. One of the blogs that Sashy follows is written from a goat stand point and it made me think of you. I have seen your chickens, horses, Sadie of course and now the goats. Thank you. oh, that must be so hard when they die! I love all the different coats yours have.Goats seem to be really good pets - I didn't know this until learning about them from you and Pricilla. I suspect I'm allergic, but I want some! Your farm, both as it is, and in dreams, looks absolutely fabulous! Hi Lily,Your farm looks wonderful,my goodness!you own such a vast area,wonder if you have outside help from time to time. Your goats are so sweet and the first one looks like he's got a faint smile on his lips ,off course i smiled right back. I read your comment about the male fishing club,well i think any story from the country will interest us city folk.Sometimes i show your farm to hubby and he was in awe of all the land/animals/espl your trailer for the horses,Compared to our little car that is HUGE.Well ,i guess the grass is always greener on the other side.....wait, it really is green on your farm. In India very few own such vast lands and they are considered RICH,best part is they hire people to work the land.Have a good week Lily. Hugsss and kisses for Derby. Wow, over 200 posts in total and I have only just found your first blog - Looks like I've got a lot of catching up to do! This is Alvond of the late days and night, I made a new account because my last account was been corrupted that's why I made a new one and here is my new URL http://my-days-and-night.blogspot.com/. I hope to see you again in my newly made account. 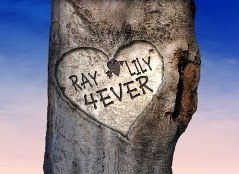 hope to seee you follow too..
Het Lily, I feel like I've been so out of touch. But I'm back now. I love your farm. Looks like a wonderful property, with or without the embellishments. And congratulations on your 100th post. I've done 100 posts in my head, but can't seem to get them all down in writing. Thanks so much for the overview of your piece of heaven. With your excellent goat photos I can see why you appreciated my "Catapano's" entry. We all need to embellish a bit now and then... the finished (ever finished? )product has to come with hard work and in stages. It's try to stay the course, keep the vision and embrace the inevitable pitfalls. If conquered, they make us stronger. Your farm is wonderful! Hubby keeps taking over my small barns, now the sheep is in the pasture and the chickens in a small coop. I have 12 laying hens, Too many roosters, lol I have the bantams chicks, I raising for the first time. I have Rhode Island Reds, Cochin, Arcana chickens I have asthma too, but as most of ours are free range, just go to the coop at night, I guess I am making it. lol Love your goats! I use to have 100+ sheep and goats, and every farm animal. I now have six sheep added back with a guard dog. Yes, on my side bar you can read A Lady's Hope. I have Breast cancer since 2003 and will be going Sept. 19 for my 40th major, major surgery. Usually put me down for a long while. I'm hoping maybe to get someone to type for me after I get home. I shall be in hospital a week or so if all goes well. Then later I will have more surgeries he says. So if you see I gone to my Resort away from home, as hubby calls it, I be at the hospital. I do love the blue and green eggs more. Hubby loves the brown eggs. I love your farm. Wow, it is really nice! And your goats are so sweet, thanks for brightening my day with this uplifting post.